Add to My Favorite Store. 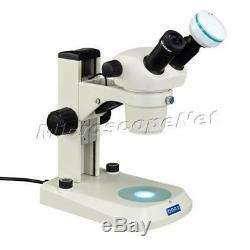 Stereo Binocular Microscope 20X-40X with Dual LED Lights and 2.0MP USB Digital Camera. This is a brand new stereo binocular microscope with two magnification power: 20X, 40X. It comes with 45 degree inclined binocular head, a pair of super widefield eyepieces WF10X/23 (30.0mm) with adjustable diopter & built-in rubber ring, a versatile illumination system that provides both transmitted and reflected LED lights, and an USB digital imaging system. The included USB digital imaging system captures still microscope images and live video on computer. The 1600 x 1200 pixels USB digital imaging system captures still microscope images and live video on computer. The included software compatible with Windows can also be used to make measurements. You can also view and capture the images on iMac or Macbook with Mac OS. The stereo microscope is useful for many applications: biological research laboratories, engravers, watchmakers, geologists, collectors, jewelers and anyone in electronic industry. 2.0MP digital camera shows/captures true color videos and images on computer, supporting PC and Mac. Dual LED illuminations with individual adjustable intensity. 45° inclined binocular viewing head with 2X, 4X objectives. Super widefield 30mm eyepieces WF10X/23 with diopter regulator. 4 (100mm) long working distance and i nterpupillary distance adjustment. Eyepieces: super widefield WF10X/23 with diopter regulator ±5dp and built-in rubber ring. Viewing head: 45 ° inclined ; binocular. Interpupillary range: 2" 2-3/4" (50mm 70mm). Field of view: 11.5mm with 20X magnification, 5.75mm with 40X magnification. Focusing adjustment range: 4 (100mm). Incident (upper) illuminator: 2W LED lamp, 90°adjustable inclined angle range. Transmitted (lower) illuminator: 2W LED lamp. Each light has its own intensity control. Frosted glass stage plate: 3-3/4 (95mm) in diameter. White/black plastic stage plate: 3-3/4 (95mm) in diameter. 54mm female thread for barlow lens. Power supply: 100-240V 50/60Hz (USA and Canada plug). Digital camera: - true color 1600 x 1200 pixels (2.0MP) - 0.45X reduction lens to get larger field of view - Software compatible with Windows, Mac OS X and Linux (see below for verison information). Dimension: 11-1/2 " x 7-1/4" x 15 (29cm x 18.5cm x 38cm). Net weight: 9 lb 12 oz (4.5 kg). Please check the chart below for computer operating system compatibility. A pair of eyepieces WF10X/23. Frosted glass stage plate (95mm). Black/white plastic stage plate (95mm). 1 CD (camera driver, software and user's instruction). 30.0mm eyetube conversion adapter. Fiber cold lights (ring type and Y type). A: We are happy to leave feedback for our customers once we have been paid and the item has been delivered to the carrier. We would appreciate that once you receive your item, you also leave us feedback. If you feel that you cannot leave a Positive comment with all 5 stars - WE WILL EARN IT. We are here to exceed your expectations! The item "OMAX 20X-40X Stereo Binocular Microscope with Dual LED Lights and 2MP USB Camera" is in sale since Tuesday, February 11, 2014. This item is in the category "Business & Industrial\Manufacturing & Metalworking\Semiconductor & PCB Equipment\Inspection Equipment".